Average fare. No maintenance hatch, fixed battery, clattery keyboard, dark display, weak GPU - the Lenovo Z51 does not really provide rays of hope. With the Z51, Lenovo launched the successor of the Z50 series. It brings changes inside as well as outside. Our in-depth review of the series' current top model, which will be available on our website soon, covers all changes/new features of the Z51 series. In this review, we will take a look at a technically slightly weaker model of the Z51 series. Computers like the Acer Aspire E5-573G and the Dell Inspiron 15-5558 compete with the Z51. 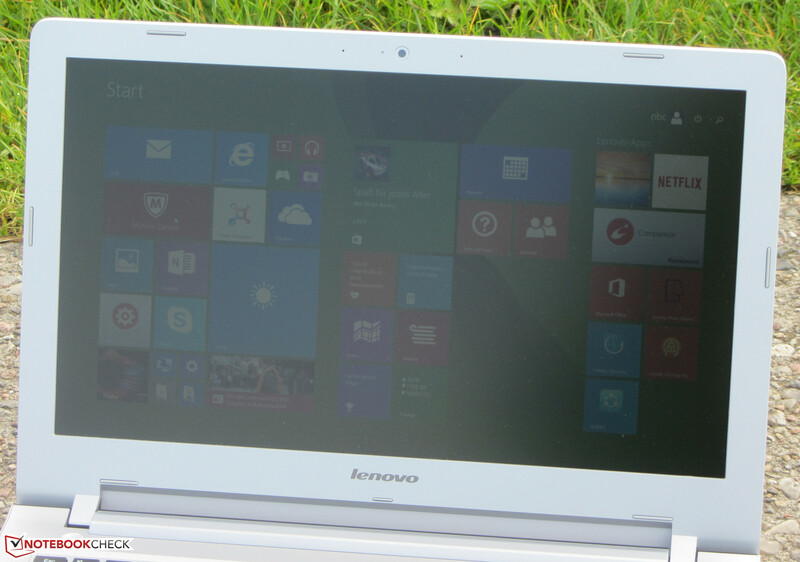 Lenovo equipped our test model with a matte 15.6-inch display with a native resolution of 1920x1080 pixels. The display delivers a brightness of 206.4 cd/m² - way too low for a 700-Euro (~$799) device. While the contrast (474:1) is still acceptable, it will not knock anyone's socks off. The average DeltaE 2000 shift is 11.08 out-of-the-box. Such values are usual for low-priced notebooks. The target value would be smaller than 3. In addition, the display exhibits a visible bluish cast. Lenovo equipped the Z51 with a TN panel with narrow viewing angles. Thus, it is not possible to read from the screen from all positions. It is not really possible to use the notebook outdoors, since its brightness is too low. Lenovo's 15.6-inch all-round device brings sufficient processing performance for everyday tasks and allows playing computer games to a limited degree. Our test model is priced at about 700 Euros (~$799). At the time of testing, there were only few other variants available. However, this might change in the coming weeks. With the Core i5-5200U processor, the Z51 houses a mid-range CPU of the Broadwell generation. As the Z51 is an all-round computer, this is a good choice. With a TDP of 15 Watt, the processor is quite frugal. It works at a base clock of 2.2 GHz. Thanks to Turbo, the clock rate can increase to 2.5 GHz (both cores) or 2.7 GHz (single core). The Turbo is used in mains operation as well as on battery. We cannot complain about the system performance. Everything runs smoothly and the results of the PCMark benchmarks are very good. The Z51 is on par with computers with more powerful graphics cards. This is due to the PCMark 8 benchmark favoring AMD GPUs. It is possible to further increase the system performance. Adding a second RAM module would activate dual-channel mode. However, replacing the hard drive with a Solid State Drive would have the biggest effect. The system would be overall more responsive and Windows would boot faster. Lenovo equipped the Z51 with a hard drive from Seagate with a capacity of 1 TB and a revolution speed of 5400 rpm. CrystalDiskMark reports a read rate of 107.4 MB/s. HD Tune delivers an average transfer rate of 84.8 MB/s. These are usual values for a 5400 rpm hard drive. The AMD graphics core of the Z51 is called Radeon R7 M360. The GPU supports DirectX 12 and clocks at up to 980 MHz. The maximum clock rate is identical to the GPU of the predecessor, the Radeon R7 M260. Accordingly, the M360 performs similarly in the 3DMark benchmarks as its predecessor. Small improvements are due to the newer driver version. According to the 3DMark results, the GPU is lower mid-range or even rather entry-level. Nvidia's GeForce 920M GPU is the direct competitor of the R7 M360. The GeForce core wins the direct comparison in the 3DMark benchmarks as well as in real-world gaming. The Enduro graphics switch allows switching between the AMD graphics core and the integrated HD Graphics 5500 GPU. The Radeon GPU is responsible for demanding applications like computer games. Intel's GPU is used for everyday tasks and on battery. Usually, the graphics cards are switched automatically, but it does not work as smoothly as the competition from Nvidia (Optimus). The user sometimes has to make manual readjustments. 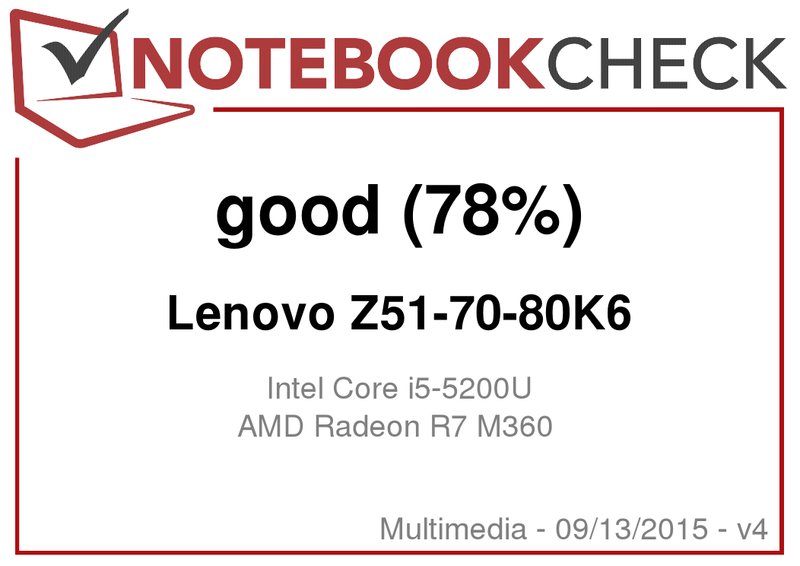 Although the Lenovo Z51-70 is an all-round notebook, computer games are only possible to quite a limited degree because of the weak GPU. Many games run smoothly with HD resolution (1366x768 pixels) and low to partly medium quality settings. Higher settings are partly possible in older games and games with low hardware requirements. Current top titles like The Witcher 3 or Batman: Arkham Knight never achieve sufficiently high frame rates. Those who want to play frequently should select a notebook with a more powerful graphics card. Models with GeForce 940M or Radeon R9 M375 GPU can be recommended. A Z51 variant with the latter is available. An in-depth review of this model will be available on Notebookcheck.net soon. The predecessor of the Z51, the Lenovo Z50 can be recommended to frugal users. Currently models with Full HD display, Core i5-4210U processor and GeForce 840M graphics are available for below 500 Euros (~$571). Z50 models with the mentioned hardware achieve significantly higher frame rates than this Z51 model. While idle, the fan even stands still sometimes, but usually it runs at low speed. In quiet environments a rustling noise is audible, but it is not especially annoying. During our stress test we measured a noise level of 40.7 dB, which is alright. The Z51 during the stress test. The Z51 behaves differently in the stress test (Prime95 and Furmark run for at least one hour) in mains operation and on battery. In mains operation, the processor clocks at 2.3 to 2.5 GHz for a few minutes. Afterwards, its clock rate falls to 2.1 GHz and remains there. The graphics core works at full speed (980 MHz) from the beginning. 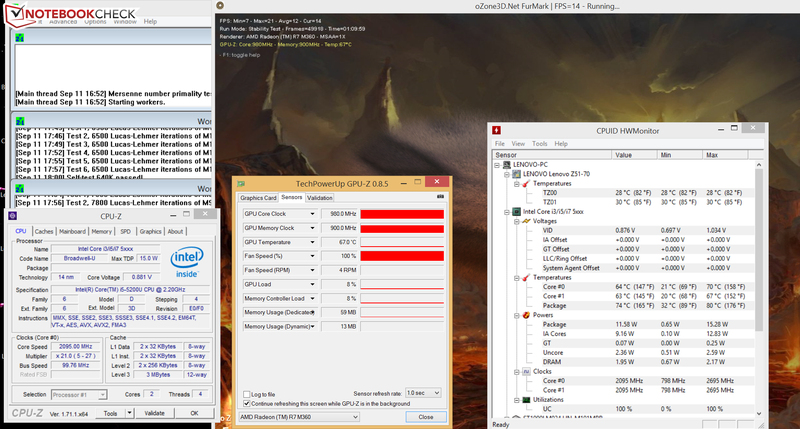 On battery the GPU only clocks at 300 MHz, while the processors works at 2.5 GHz. The temperature increase is only moderate. 40 °C is only exceeded in three measurement segments. In terms of power consumption, the Z51 proves to be very frugal while idle. We measured a maximum power consumption of 6.2 Watt - a good value. The energy demand also does not reach an unexpected high value under load. During our stress test we measured 43.3 Watt. The rated output of the power adapter is 65 Watt. Thus it has enough reserves. About 39 Watt (+/- 5 Watt) is realistic during real-world gaming. Hence, the Z51 requires slightly more energy than comparable computers like the Dell Inspiron 15-5558. In our realistic WLAN test, we simulate web surfing. The profile "balanced" is active and the display brightness is set to about 150 cd/m². The Z51 achieves a battery life of 5:34 h.
The Lenovo Z51-70 brings sufficient processing performance to satisfy most users. The built-in graphics core allows occasional gaming. The computer usually works quietly and does not get especially warm. Thanks to a 1 TB hard drive, users won't lack storage capacity quickly. We are not delighted by the quite springy keyboard of the Z51. The matte Full HD display also deserves critique. Lenovo incorporated a dark TN model with narrow viewing angles. We expect more for a street price of about 700 Euros (~$799). Finally, Lenovo saved money with the graphics. Compared to the predecessor, the Lenovo Z50-70, there are further changes which we dislike. 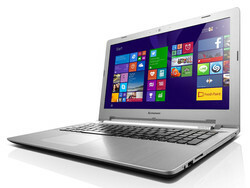 For example, Lenovo omitted the maintenance hatch and fixed the battery. You need to open the case of the Z51 in order to replace the hard drive or increase the RAM. Overall, the Lenovo Z51 is rather a step backwards than a progress. Thus, the predecessor is an inexpensive alternative to the Z51, too. Z50 models with Full HD display, Core i5-4210U processor, and GeForce 840M graphics are currently available for slightly below 500 Euros (~$571). More information about the Lenovo Z51 series is available in our in-depth review of the current top model of the series, which comes with a Radeon R9 M375 graphics card and a Solid State Drive. The review will be available on our website soon.